The Magicians – If Harry Potter and Chronicles of Narnia had a gritty teenage son, this would be it. The similarities gave the touch of familiarity, but sometimes seemed to rely too heavily on these classics. That being said, I love both HP and Narnia so thus, I should enjoy this book and I did. That being said – The Magicians is the first in a trilogy and after finishing it I had no intention in reading the next. Take from that what you will. The Happiness Project – This book made me happy. As the author goes on a quest to find personal happiness, she shares her ideas and inspirations per month to attain her goal. I wasn’t enthralled in the book like I was with the similar Carry On, Warrior possibly due to writing style or just not feeling as connected to the content. But I was intrigued by it. There were several things I will take from the book to do personally to increase my happiness, namely continue my blog and sing in the mornings. 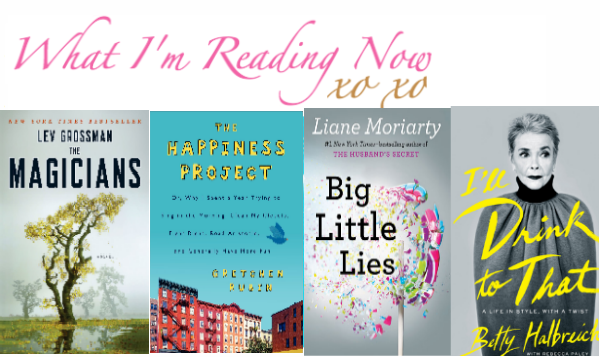 Big Little Lies – The parents in Gossip Girl would read this. The parents of elementary students wishing they were in Gossip Girl would read this. Basically if you like gossip and drama you would read this. It felt like a YA novel a few times with it’s ease of reading; however, there were several plot twists that made me audibly shocked, not typical of a YA novel. Overall, I really enjoyed this book and flew through it in a few days. Next on my list is another from the same author, The Husband’s Secret. I’ll Drink to That – This autobiography is phenomenal. I’ve only read a few autobiographies in my life (one being Benjamin Franklin’s that I surprisingly really enjoyed), but this one outshines them all. Her life is so fascinating and unique from mine that I often felt like I was reading fiction. I was so thirsty for more Betty Halbreich after finishing the book I immediately googled her, to find interviews, photos and then happily stumbled upon the fact that Lena Dunham is creating an HBO series about her. My grade for this book is an A+, I’ll drink to that. This entry was posted on October 21, 2014 by milledavis. It was filed under Books, Reviews and was tagged with big little lies, book reviews, books, I'll drink to that, the happiness project, the magicians. Thanks to all the teachers at Elm Tree Elementary for instilling the love of reading in Mille!